I just looked at a few bank pages online and then just started creating my shapes on my own. Overall I think it turned out good. The pieces you will need are: head, two ears, two eyes, nose, 2 buttons, body, four legs, two of which are short, and four hooves. First, I glued on the top legs. 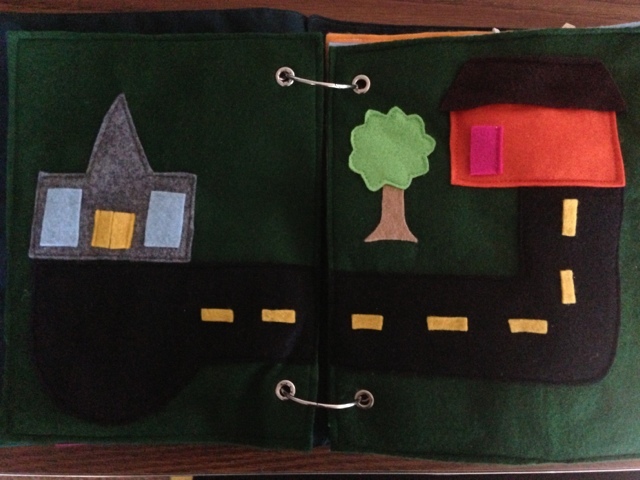 Next, I stitched around the opening to prevent it from stretching as the kids play with it. Glue boxes of velcro on the back side where you want it to open. Place the other side of the velcro on, so it will line up perfectly. 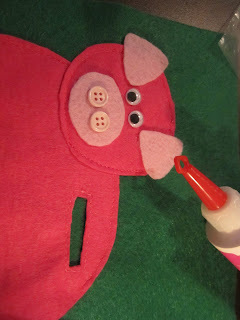 Pin down the pig and pin up the part with velcro so you can place glue on it later. 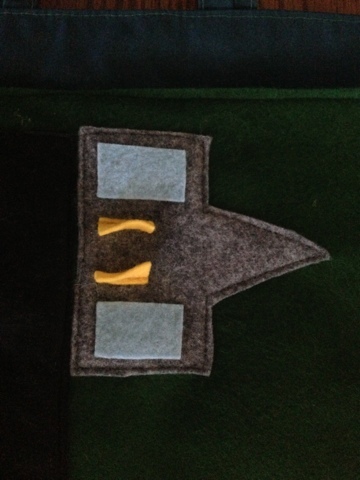 But first, you will notice that you have to sew on the back foot first, before glueing down the velcro. So, sew the tiny foot on. And then you can glue and put down the velcro back side. After it's dry you can sew around the rest of the pig. 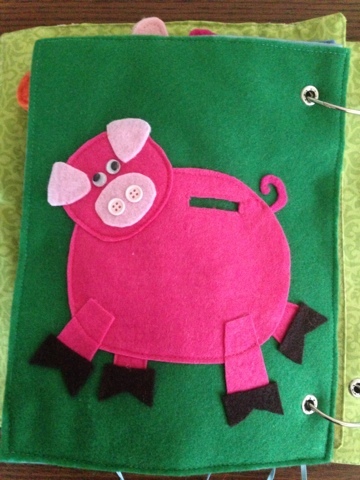 The only part I didn't sew over were the ears of the pig. I glued those on too. Then honestly out of laziness I glued down the hooves instead of switching my thread color. Here is the final page again for you to see. Don't forget to add a curly tail. I just placed it under the flap that opens to get the coins out. I was trying to find the curly shoelaces but they cost a fortune, so I opted for a felt curly tail. Hope you enjoy! My girls love the playing with the plastic coins with their pig. Nothing fancy in this post but I just wanted to share how we announced to our family we were expecting number two. We usually send a group of photos to the grandparents on occasion to their Costco for them to pick up. If you haven't ever thought of doing that you should consider it. It's a way for the grandparents to have up-to-date pictures in their frames. I just choose pictures, upload on the Costco website and when ordering I choose the pick up from warehouse option. Then I pick their warehouse. I tell the grandparents I sent some pictures. They pick them up, in my name, and pay for them there, which also makes it free for me! But the grandparents never complain and they actually ask me occasionally to send some more if I haven't done it in a while. Well, if you were unaware of my roles, besides being a mother, daughter, wife, church volunteer, teacher, graphic designer, and maid (at least it feels like it), I am also a web designer. I actually use to work for my brother's website design company he owned. Since the company closed I still have done a few websites for friends. It's nice to be able to do them when I want to. Plus, it's a little extra money. That's always good :) Since moving out to Texas and getting involved at our church I couldn't stand by and watch their pitiful website any longer. Really.....it was pretty bad!! Anyways, what better than to use the gift God has given you to better his kingdom, right? 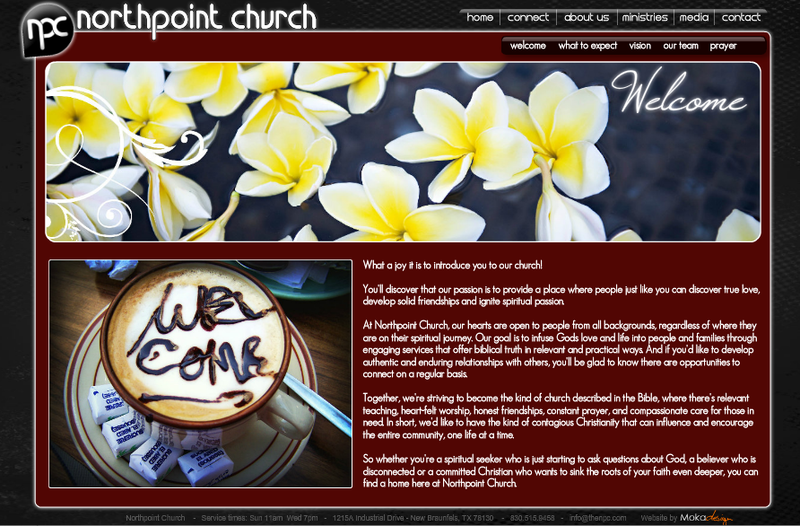 So, here's a few photo clips of the new church website I designed. I say new, but really it's been up for about 3 years now. Ha! Man, time flies! The homepage (top picture) has a gallery that filters through the current series as well as upcoming events. And the buttons on the bottom link to additional pages. Here's the link if you want to see more. It was a lot of work to gather all the information and get pictures of the rooms and pages for all the galleries, but I think it turned out nicely. I wish I took a before picture. Plus, there's a ton of more information on here than the previous website. I think they only had three pages and my current design has....well, A LOT! 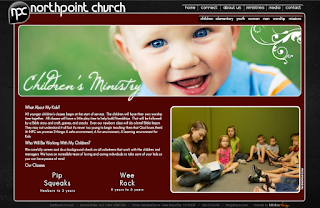 Church websites can become really complicated with having so much information and keeping it from becoming a maze of links. 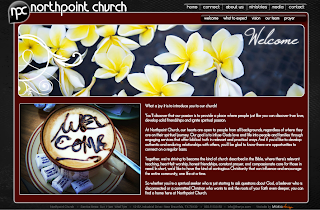 I wanted this to be really user friendly and just look more classy and trendy to fit our churches style. My favorite thing is meeting new people that come to the church and I ask them how they found us and almost guaranteed- it's because of the website! They liked the look and feel of the website and that's what brought them. 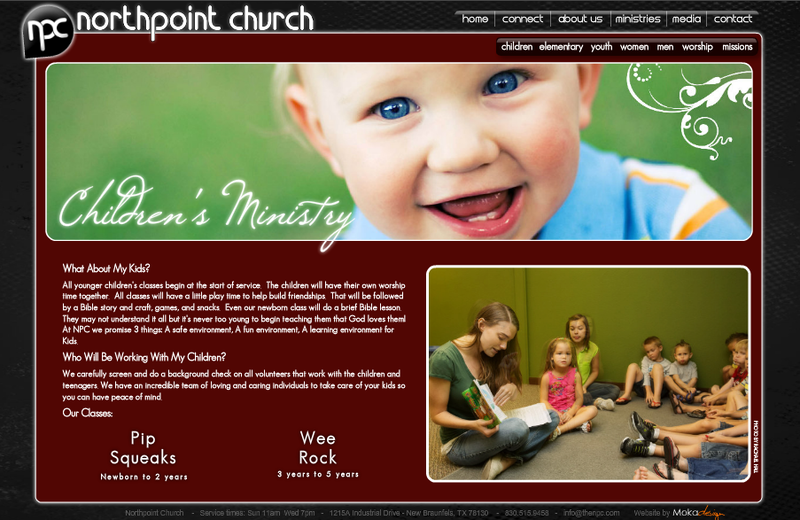 A lot of people were surprised by the size of our church because the website looks so professional (I always insert a pat on my own back here). Mission accomplished. That's exactly what I wanted it to be - a professional looking website. After I found out they found us from the website I always ask them what they think about it. I usually don't acknowledge any involvement until I get honest feedback because that's what keeps my eyes fresh on the website. Anyways, maybe I'm rambling on for a mostly crafty website but just know that website design is a part of my serving the Lord too and I'm proud to do it! Hope you enjoyed the design. This is the Going To Church Page. It has a car that represents ours and you drive it down the street to the church. It's really fun and simple. The girls seem to really like this page. 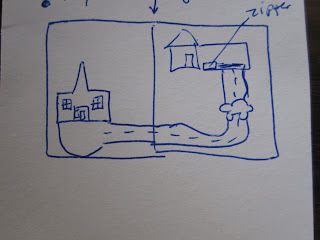 To start here are all the pieces you'll need: tree top, tree trunk, house, roof, door for house, two pieces of the street, church, two church windows, two doors to church, a bunch of yellow strips for the lines on the road. 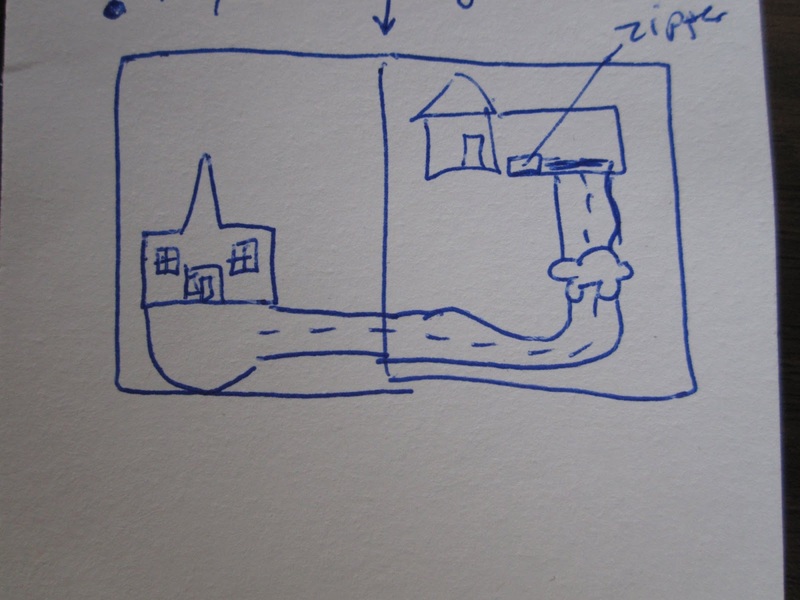 Here were my plans when I first started, it kind of shifted and turned into a church page. 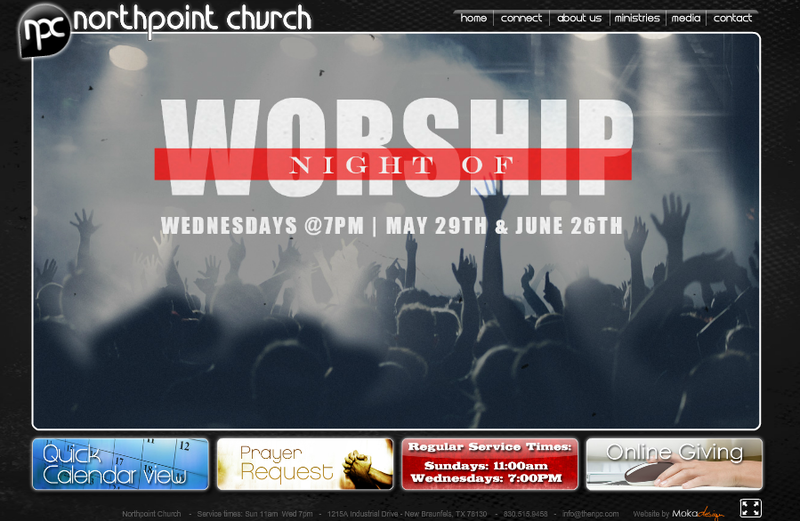 It was originally just a car driving page, but why not incorporate some church into it I say?! Here's everything pinned down and ready to sew. 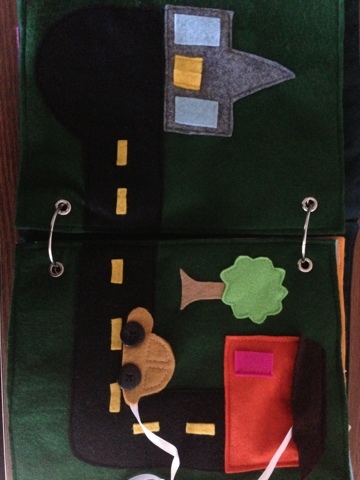 Before you start sewing I made sure to glue down the stripes for the road. Here's the final picture again. The doors on the church open and the top of the roof of the house opens to reveal the gold car that comes out and can drive down the road to the church. The girls especially love pretending their friends are coming in and out of the doors. I recall a time when I was working at a school and was in the kitchen getting an ice bag for an injured student when a teenage helper walked in to get something as well. We chatted a little bit while I got out a baggie and then the ice from the freezer. Continuing our chat she watched as I twisted the ice cube trays to get out some ice. "What?! Is that how you're suppose to do it?" she said. "What do you mean? ", I asked. She responds, "I've always wondered how people get ice out so easily. I've always used a knife and picked out each ice cube." I laughed to myself. Had she really never known to twist the cube trays to loosen the ice first? Looking back on this moment many a time (I know it's weird I remember this ice cube story often) but...I'm reminded how even the simplest things can't be expected unless they are taught to you. Unless someone had shown this girl when she was little how to twist the tray to get out the cubes how could she be expected to know to do that? She couldn't. I am always striving to provide new opportunities to teach my girls and show them how to do things. I mean, that's what parenting is, right? Well, this week I got a mini broom at the store that was just too cute to resist. So this weeks task to learn: how to sweep. Kara is such a sweet girl and always wants to be mama's little helper. One of the frustration points with me is cleaning up after these girls eat. I don't understand how two girls can seriously miss their mouths so much. Maybe it's a secret contest of who can get the biggest spread of debris from one meal but I can never keep up with it. 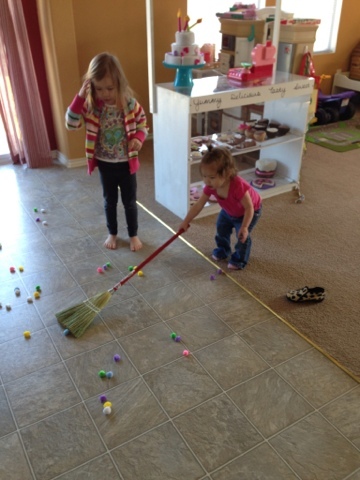 So, Kara is going to be trained to start sweeping underneath her own table. 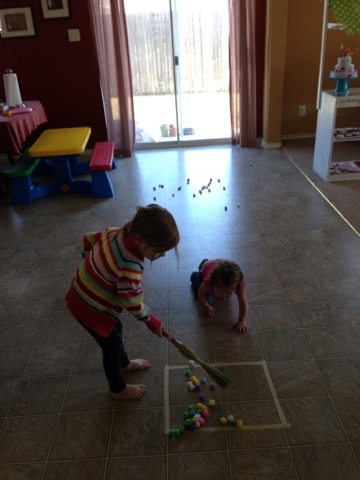 The first task is learning how to sweep at all. Then I'll tackle using a dust pan and then sweeping actually under the table for her food remnants. I started with a square of masking tape on my floor. I made sure it was fairly large at first and can make it smaller as her skills improve. Then entered a big bag of Pom poms. I threw them across one side of the floor. 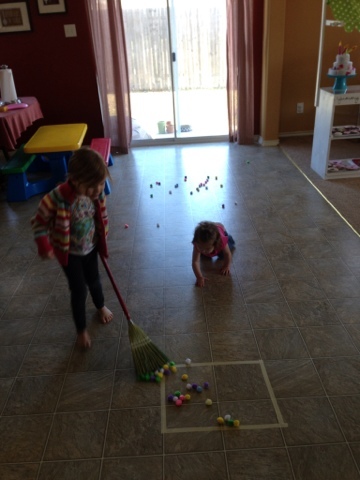 Her task was to sweep all of the Pom poms into the square. Sister had to get in on the action too. 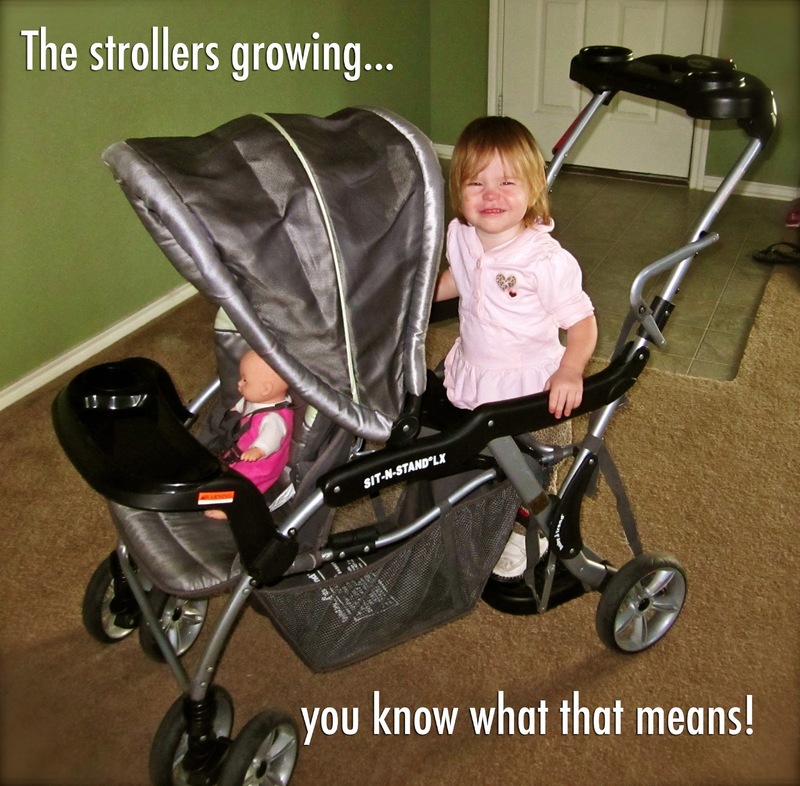 Now while her approach might not be perfect, we're tackling one thing at a time. We'll start working on form after she gets a little success under her belt. Hope you'll take the time to train your children in the way they should go...and not just expecting them to magically arrive there.